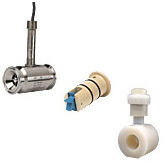 Thornton offers a variety of paddlewheel, vortex shedding, and sanitary turbine flow sensors to meet the needs of most ultrapure and pure water treatment applications. Smart flow sensors convey their precalibrated values to the 770MAX instrument for ease of installation and startup. Pulse flow sensors can be used with the 770MAX or M300 instruments.